We’d love your help. Let us know what’s wrong with this preview of Battles of The New Republic by Prashant Jha. In the past decade, Nepal has undergone arguably one of the boldest political transformations in South Asia. Identity based politics had brought long-marginalized social groups into the mainstream and upended the bulwark of Nepali nationalism- the Hindu Monarchy. Yet, the process of change has repeatedly broken down, and Nepal’s fragile polity, under stress from various fo In the past decade, Nepal has undergone arguably one of the boldest political transformations in South Asia. Identity based politics had brought long-marginalized social groups into the mainstream and upended the bulwark of Nepali nationalism- the Hindu Monarchy. Yet, the process of change has repeatedly broken down, and Nepal’s fragile polity, under stress from various forces, has continuously fragmented- the first Constituent Assembly failed to draft a Constitution; the Maoists, who sparked the transformation with an armed insurrection and once represented hope, have been co-opted into the very political culture they once challenged; never-ending political negotiations have chronically paralyzed the governance initiatives needed to address Nepal’s problems; and India, the country’s powerful neighbor, has played an overwhelming role in national politics, choosing to intervene or stay away at crucial junctures. In exhaustively analyzing all these issues, Prashant Jha covers extensive territory, in the corridors of power in Kathmandu and New Delhi as well as on the ground in Tarai, and forges a narrative that is as comprehensive in its overview as it is detailed in chronicling the minutiae of day to day politics. An unprecedented account of the re-birth of a nation . To ask other readers questions about Battles of The New Republic, please sign up. A book that will serve to educate anybody willing to learn about Nepal’s history and its facets through its transitional journey into the Democratic Republic. A powerful and passionate book for Nepal that demands it be read. 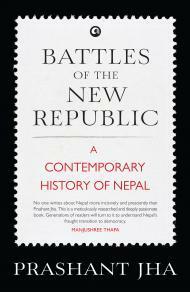 This is a story of the politics of gradual revolution, where former rebels attempt to change the mainstream even as the mainstream co-opts and changes them; of partial sovereignty where domestic political actors have to grapple with the r A book that will serve to educate anybody willing to learn about Nepal’s history and its facets through its transitional journey into the Democratic Republic. A powerful and passionate book for Nepal that demands it be read. This is a story of the politics of gradual revolution, where former rebels attempt to change the mainstream even as the mainstream co-opts and changes them; of partial sovereignty where domestic political actors have to grapple with the role of a regional power in a complex international environment; of inclusive nationalism where marginalized social groups struggle for dignity and power and challenge long held notions of what constitutes being a citizen ; and of institutionalizing shanty and sambidhan, peace and the Constitution, in a polity governed by a fragile balance of power, with no outright victors or losers. This is a story of how managing political change is always more difficult than the act of bringing about it. This is a story of war and peace, of the fate of a revolution, of popular aspirations, of weak and strong men and their ambitions and vulnerabilities, of the deepening of democracy, and of the death of a dream. Ultimately, it is a story of a society and a nation grappling with the fundamental political question of who ought to exercise power, to what end, and for whose benefit. This is a tough book to read but it is nevertheless an important book if you want to understand Contemporary Nepal politics. It starts around 2005-06 when widespread popular protests forced the King gave up his position and efforts to draft a new constitution started (a federal-secular democratic-republic constitution for the first time in the history of Nepal). It is a comprehensive book that covers the various sections of Nepali society from Janjatis (tribes), Maoists and Madhesis (People from This is a tough book to read but it is nevertheless an important book if you want to understand Contemporary Nepal politics. It starts around 2005-06 when widespread popular protests forced the King gave up his position and efforts to draft a new constitution started (a federal-secular democratic-republic constitution for the first time in the history of Nepal). It is a comprehensive book that covers the various sections of Nepali society from Janjatis (tribes), Maoists and Madhesis (People from South Nepal plains) and how the dynamics of the demography shaped the process. This is also why the book is difficult to read: the number of different political players and their narrative threads bloat as the book goes on. The author, unwaveringly pursues them, following the main players across the Nepali political spectrum. There were parts where I skimmed through when overwhelmed with detail. But looking back, the chronicles will make interesting reference material - if not compelling reading material. In his first book as a writer Prashant Jha tries to do justice to the diverse Nepali history and does touch upon all major events but fails to communicate effectively the gravity of some of the defining moments of the Nepali revolution. He fails to provide a context, actual happenings and finally allows his own judgements to cloud the final conclusions he puts forth. A history writer's responsibility is that he provides all sets of opinions and let the reader decide for his own conclusions. All s In his first book as a writer Prashant Jha tries to do justice to the diverse Nepali history and does touch upon all major events but fails to communicate effectively the gravity of some of the defining moments of the Nepali revolution. He fails to provide a context, actual happenings and finally allows his own judgements to cloud the final conclusions he puts forth. A history writer's responsibility is that he provides all sets of opinions and let the reader decide for his own conclusions. Important book that educates us about Madhes discussion in Nepal. The chapters that share stories and the anecdotal accounts of the author provide an explanation to the Madhesi issue and are primarily interesting and important. I would recommend this to anyone seeking to know about contemporary history of Nepal. Documentation is almost objective. Good account of main events. A well-written account of very complex and confusing politics but this in a heavy-weight read and can be a bit hard to follow at times, especially if you didn't start out knowing some of the key characters already. The frequent use of acronyms also slowed my reading a lot. I was puzzled why none of the photos had captions - except in the contents list. Seemed v odd to have to leaf back to see who was in what photo. As an expat currently living in Nepal I have pickrd this book hoping that it would allow me to understand recent history of the country. Unfortunately this isn't the right book. The book reads like a report on meetings and backstage negotiations between various political parties, it provides lots of detailed information, but doesn't put them into context. It the future though it might become a valued resource for an academic study. Excellent account of Nepal's "quite" recent political history - however very, very, very detailed which makes it a slow and sometimes exhausting read. However, very well documented and exhaustive, useful for anyone who seeks to better understand Nepal from a political point of view.